To get this started, a moron billionaire destroyed a chateau in Bordeaux, le château Bellevue, by leaving his illegal Polish workers nebulous instructions to tear down and clean up his property. While he was conveniently away Fortunately, albeit too late, an investigation has been launched. Apparently the aforementioned moron thought the chateau was in poor taste (go back to Russia and renovate your own "beautiful" palaces...) and plans to erect... of course, a reproduction. And how about "Downton Abbey"? The castle is actually the sight of an Egyptian antiquities loot from the long-fingered Howard Carter. It's since been mostly passed to the Americans and is found nowhere near Egypt yet. Anyone notice they gave the dog in Downton Abbey the name "Isis"? Talk about arrogance! I saw Elvaston Castle last night on my fave show - I could live in a pile like that. It has a beautiful ghostly love story too. Sigh! Sigh! A few months to go. I so need a holiday. I think context is a wonderful way to measure men, those who called these places home and then, the others. It was an interesting visit to watch. Putin should relax with the botox, worse than Charlene. Interesting like travelling salesmen stopping by, or Jehova's Witnesses It doesn't advantage them, either way. Oh, no, him receiving Putin in Versailles had a reason. 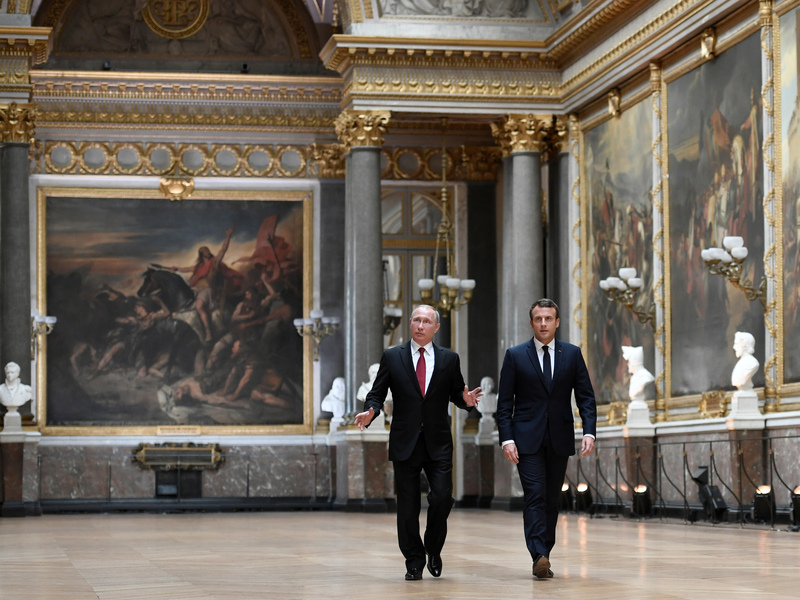 Versailles has an exhibition about Peter the Great, who exactly 300 years ago visited Paris and the diplomatic relationship between the two countries were established, and Putin attended the opening with Macron. I don't know if the backdrop of a Tsarist war like the one involving Napoleon in Russia where both sides were financed by the family of Macron's employers in the banking sector, is all in good taste or just a sarcastic send-up. French troops were decimated, 200k going in and about what? 10k who came back? Posturing is always nice, like executive orders. And I think Trump is about to step out. Period. Though I'm not a total stranger to chateaux... Another one on my wish list is in Scotland, to visit the ghost of Lady Drummond some day. For any Vivaldi fan, Venice is up there. However if I were ever to buy an Italian castle, I would buy the abandoned Sammezzano. It's Moorish and splendid on the inside.